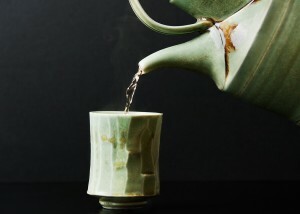 I focus my attention on making beautiful handmade utilitarian ceramics that enhance our daily lives. I am always striving to achieve excellence with every piece that I create. My first foray into the world of clay was in Mrs. Mott’s junior high school crafts class where I got a brief introduction to hand building and an even shorter introduction to throwing on a kick wheel. High school crafts courses offered the chance to explore a variety of mediums, but no ceramics. It was not until junior college that I took my first real ceramics course at Sacramento City College. I suppose it was luck that I was in the right place at the right time, when local potter Nicholas Guerrero of Omega Studios came to City College looking to hire a couple of studio assistants. I managed to land one of the positions at the studio and learned a great deal being in a professional environment. It was during my time at Omega Studios that I was officially bitten by the “ceramics bug”. After City College, I moved to San Francisco to pursue my interest in the arts. I enrolled at San Francisco State University where I earned a Bachelor of Arts degree. During my years at SFSU, I had the opportunity to study at Waseda University in Tokyo, Japan as an exchange student. During my studies in Japan, my proposal for an independent study was accepted and I had the opportunity to live and work in Mashiko, Japan with local potter Tsudo Takeo. It was in Mashiko, that I had the opportunity to experience working outside of a university art program and this renewed my love of of making pottery for daily use. After college, life got in the way and I took a sixteen year break from working with clay. I entered an apprenticeship program in the construction trades, and trained as a tile setter with the Bricklayers and Allied Craftworkers Union. I continue to do this work today. 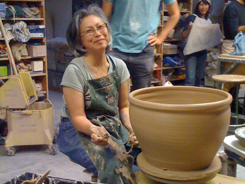 I found my way back to ceramics by taking classes at The Clay Studio in San Francisco, California in 1997 and entered a private studio space in 1998. Until its closure in late 2011, I taught classes at “The Clay Studio,” an established and highly regarded clay workspace. After moving and completing the build out of our new studio, I continue to teach classes at sfclayworks. Through teaching, I discovered my enjoyment of sharing my passion for clay. It is always a joy to see others experience the same excitement I did years before. In the last few years, my work has been focused on making utilitarian pottery with porcelain clay, fired in a gas reduction kiln to approximately 2350* F. I have a particular interest in working with the ever changing and elusive carbon trap shino glazes. Though I have been working with clay for many years, I still find myself excited and intrigued by the different discoveries I make along the way.